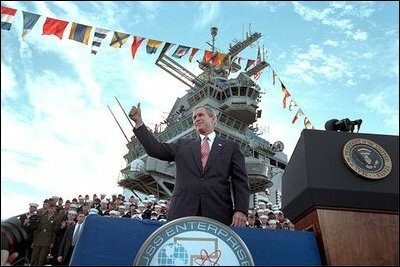 Addressing veterans, servicemen and women and families, President George W. Bush gives a thumbs-up during his speech marking the anniversary of Pearl Harbor on the U.S.S. Enterprise Dec. 7, 2001. "What happened at Pearl Harbor was the start of a long and terrible war for America. Yet, out of that surprise attack grew a steadfast resolve that made America freedom's defender. And that mission -- our great calling -- continues to this hour, as the brave men and women of our military fight the force of terror in Afghanistan and around the world," said the President.